contact me if you want to purchase them: . 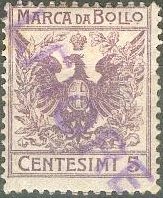 Many fiscal stamps of Italy exist, most of them have the inscription 'marca da bollo', 'tassa di bollo' or 'riscontro', they often resemble postage stamps. 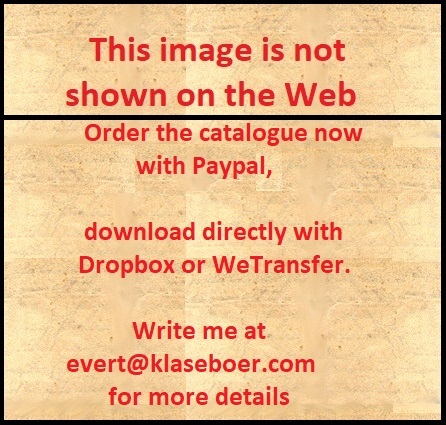 If anybody posesses pictures of fiscal stamps of which I do not posess a picture yet, please contact me! The following values should exist: 50 c blue, 1 L red, 2 L lilac, 3 L green and 5 L red (sorry, no picture available yet). The following values should exist: 50 c blue, 1 L orange, 2 L violet, 3 L green and 5 L red (sorry, no picture available yet). The following values should exist: 1 L orange, 2 L lilac, 2 L blue, 3 L green and 5 L red (sorry, no picture available yet). The following values exist: 5 c, 50 c, 1 L, 1 L 20, 2 L and 4 L (all in the colour red). Sorry, no picture available yet. The following values exist: 5 c, 10 c, 50 c, 1 L, 1 L 20, 2 L and 4 L (all in the colour lilac). A proof of the value 3 L seems to exist. Furthermore the following surchared stamps were issued in 1866: 10 c on 5 c, 10 c on 1 L 20 and 3 L on 4 L (two types). In 1871 some red wavy lines were applied to the values: 50 c, 1 L, 2 L, 3 L and 4 L. A postal forgery of the 1 L (with wavy lines) seems to exist (I have never seen it). The following values exist: 15 c, 25 c, 50 c, 1 L, 1 L 50, 2 L, 2 L 50, 3 L, 3 L 50, 4 L, 4 L 50, 5 L (all in violet), 10 L violet and red and 20 L violet and red. Various surcharges were applied in 1866, such as the 45 c on 25 c as shown above. 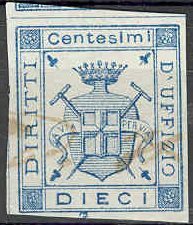 Other values exist, also stamps with the corners overprints with brown wavy lines (1871). The following values were issued: 10 c, 50 c, 1 L, 2 L, 3 L and 4 L (all in the colour lilac). 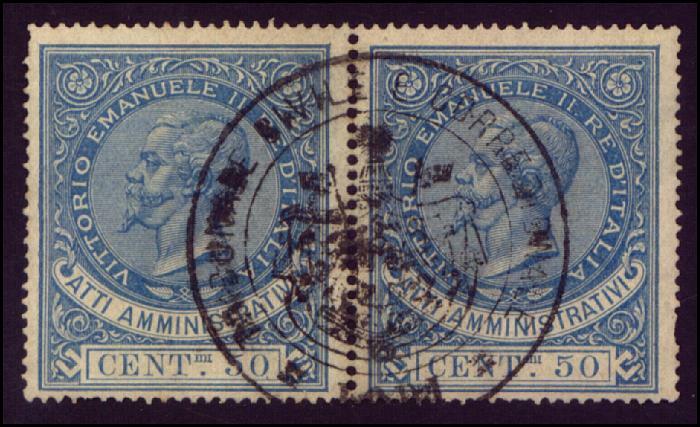 The values 2 L and 4 L exist with black wavy lines in the corners (1911). I've also seen this stamp with overprint 'CINEMA'. The 1 L, 2 L, 3 L and 4 L also exist with brown wavy lines at the corners (issued 1911). I've also seen a stamp with value 'CENTESIMI 65' in the colour brown, more values might exist. in green: 1000 L, 2000 L.
The 1 L, 2 L and 5 L also exist perforated. The values 1 L blue and 3 L brown were issued. These stamps are rare. Sorry, no pictures available yet. The first stamps with this inscription were issued in 1875 (large size with King Emanuel II); 12 values ranging from 5 c to 15 L (all in colour lilac). Sorry, no picture available yet. 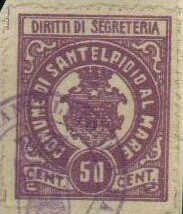 More stamps with inscription 'PESI MISURE MARCHIO' were issued from 1882 onwards (double stamps, with image of King on one and number on the other). Both the image of King Humbert (27 values from 1 c to 30 L all in lilac) and King Victor Emanuel III (1910, 27 values ranging from 1 c to 30 L in various colours) were used. 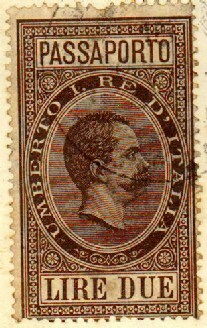 Other values in this design (see the 20 c brown) and surcharges were issued after 1908.